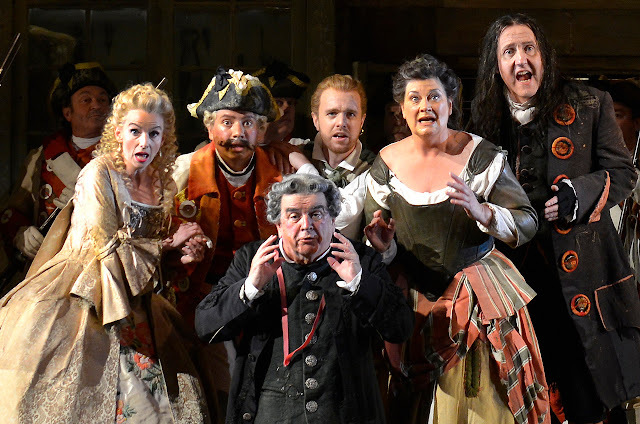 After thirty years, Jonathan Miller’s production of Rossini's The Barber of Seville returns to the English National Opera at the London Coliseum for it’s thirteen outing. Revived by Peter Relton, the Mexican tenor Eleazar Rodriguez and Australian baritone Morgan Pearse return as Count Almaviva and Figaro, conducted by Hilary Griffiths. Sarah Tynan, last seen in ENO’s Partenope (see our review), and Alan Opie, having been the production’s original Figaro (captured on disc for Chandos) make their role debuts as Rosina and Dr. Bartolo. They are joined by British bass Alastair Miles as Don Basilio and English mezzo-soprano Yvonne Howard as Berta. The plot, as described by Beaumarchais, is pretty ordinary. “An amorous old man means to marry his ward the following day: her young lover, cleverer than he is, prevents him from doing so, and that same day makes her his wife, under her guardian’s nose and in his house”. The delight of Rossini’s absurd and subversive opera buffa is the self-conscious complicity of both performers and characters in the unfolding drama. Theatre as theatre if you like – I never tire of it. 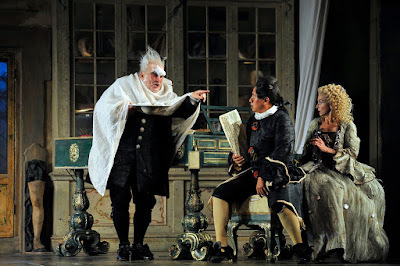 Having seen this Barber a little after it’s inception, Jonathan Miller’s Commedia dell’Arte inspired frivolity, Tanya McCallin’s unfussy 18th Century setting and Amanda and Anthony Holden’s witty translation are holding up rather better than I am. After a lack-lustre start which felt like someone had left the handbrake on - the Count’s accomplished “Ecco ridente” passed almost unnoticed. 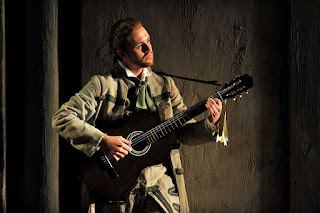 The youthful ringing baritone and easy charm of Morgan Pearse gave us a badly needed injection of brio in “Largo al factotum” that shook off the torpor. By the time we met Sarah Tynan’s coquettish Rosina the handbrake had been released. Her sparkling coloratura and impeccable diction were a delight. She has a insouciant virtuosity that is enviable and infectious. Eleazar Rodriguez’s mellifluous voice began to blossom in seeming synchronicity as did his impish charm. Alan Opie had great fun as the splenetic fossilised crustacean Dr. Bartolo, not the usual overblown buffo clown, and all the better for it. Alastair Miles lubricious Don Basilio and Yvonne Howard’s charming Berta all added to a beguiling evenings entertainment. At the final curtain the audience rose in appreciation at Jonathan Miller’s appearance – and why not?